Summary: A different approach to and ascent of Pen-y-ghent is provided by this walk that starts and finishes in the village of Litton in Littondale. 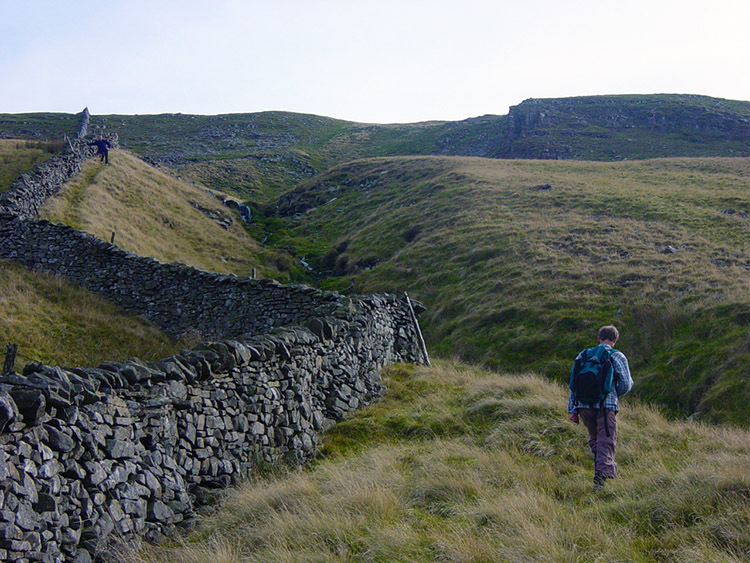 The walk certainly keeps you away from the crowds as it makes its way from Litton to Foxup via Halton Gill. 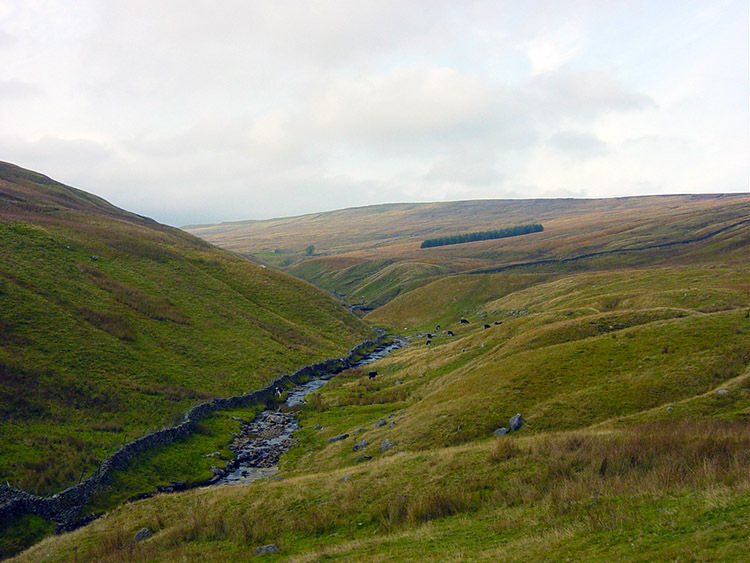 From Foxup the walk takes you on to the fells by following Cosh Beck upstream to its source at Cosh Beck Head. 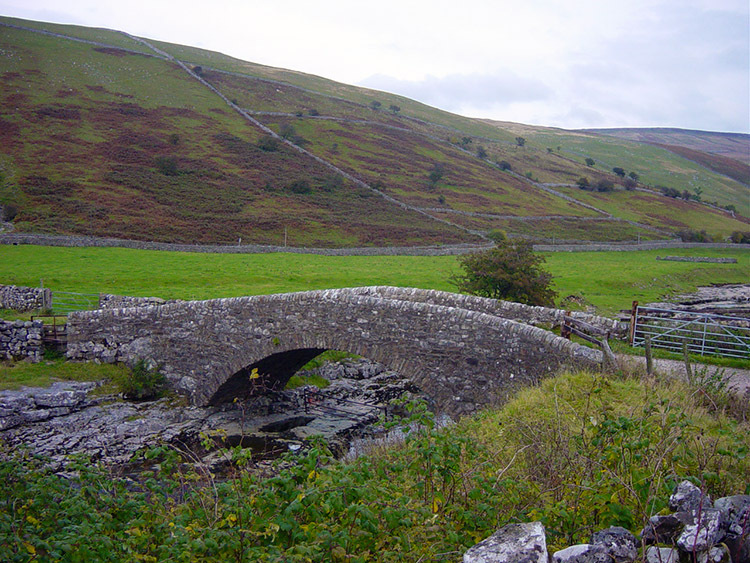 From the head walk over the open and quiet moor of Cosh Outside to Swarth Gill Gate. Catch your breath here as there is now a steep ascent of Pen-y-ghent to be made by following a watercourse up onto the Plover Hill plateau. 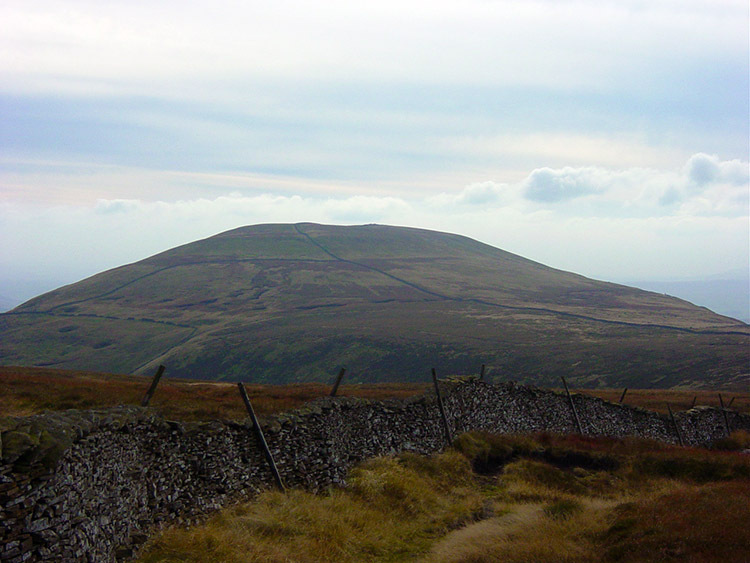 Then walk to the trig point of Pen-y-ghent itself before scrambling down steeply to Fawcett Moor before following the Dawson Close bridle road back to Litton. At 14 miles its a long walk but entirely fulfilling. Dave, Jez and I set out to Litton backed up by good weather forecast. Typical of such forecasts in this unpredictable land they did not get it quite right for although it stayed dry for the duration of the walk we did not get as much of the promised sunshine as we would have liked. We got precious little as only the second picture shows any shadows. 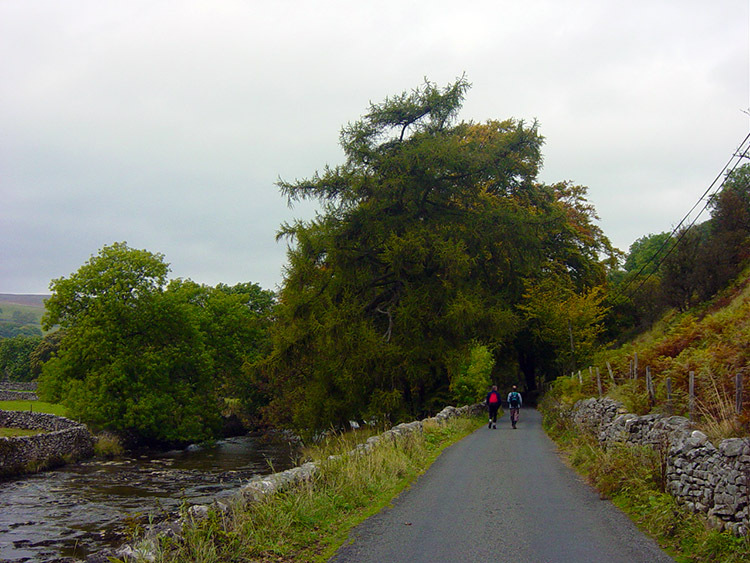 It was also quite cool but then we were well into October when we did this walk that began in the village of Litton. It was a strange beginning. As soon as we had parked up this fair lady, not the type lads like us would ignore, came and greeted us with a tale of crime in the dales. On the Friday evening a group of youths had visited Litton and tried to hot wire nearly every car in the village. Pandemonium ensued and this gallant girl had rushed out of her house (which was now cut in two to keep estranged hubby out of her bit) in nightdress, coat and boots to confront the raiders. It was a night of mayhem and fair damage was done. It was a peaceful village now though and after she had finished her tale we set off on our walk along the tarmac but very quite road to Halton Gill and Foxup. While walking we discussed the lady and why she had been so keen to tell us she was all alone in that big house of hers. Strange, but Jez thought it was because of his charismatic looks and charm. Eventually the conversation with the lady was forgotten as we set about the serious business of leaving the road and ascending the moor via Cosh Beck. I had never been in these parts before and Cosh was a good walk in the company of the beck as we followed it upstream to Cosh Outside. 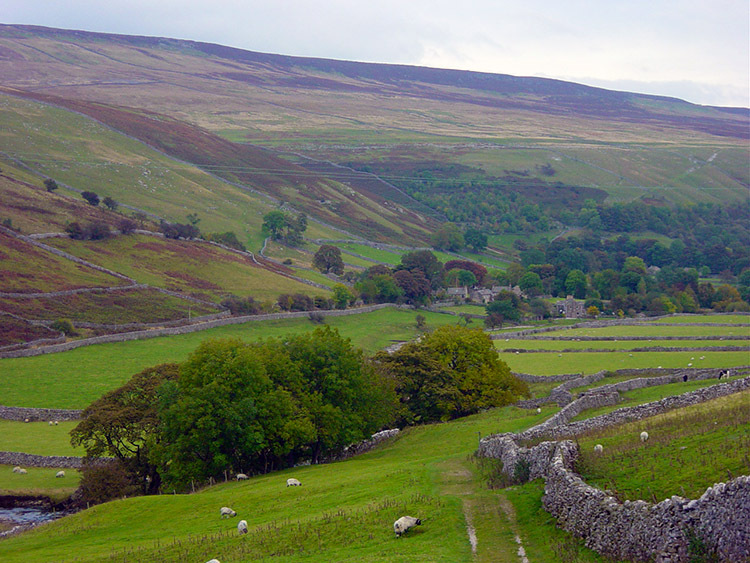 The dale reminded me of the Dales Way section from Oughtershaw to Cam Houses which was the next valley to the north. It is very similar. Once at height on Cosh Outside we gained our first sight of our next target. It was Plover Hill the smaller partner of the majestic Pen-y-ghent. 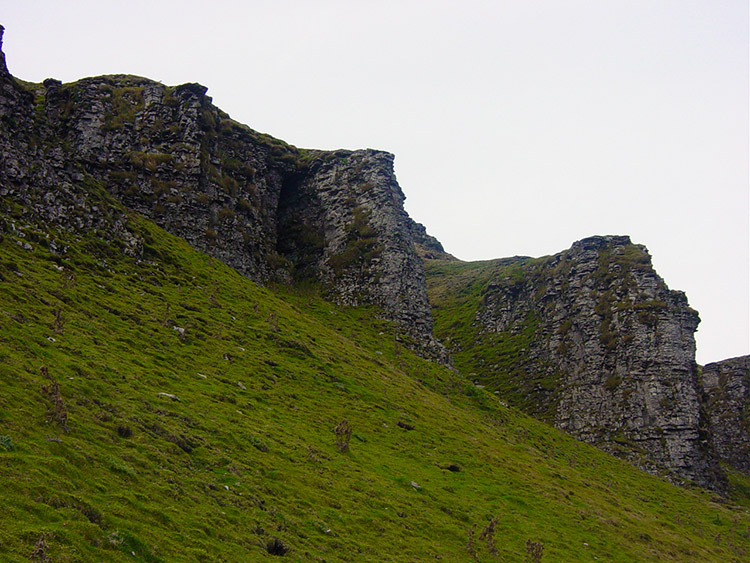 We tracked across Cosh Outside to the northern face of the hill at Swarth Gill Gate. As we approached I could not keep my eyes off the hill as there was a steep climb looming, the only question being which way do we do it. 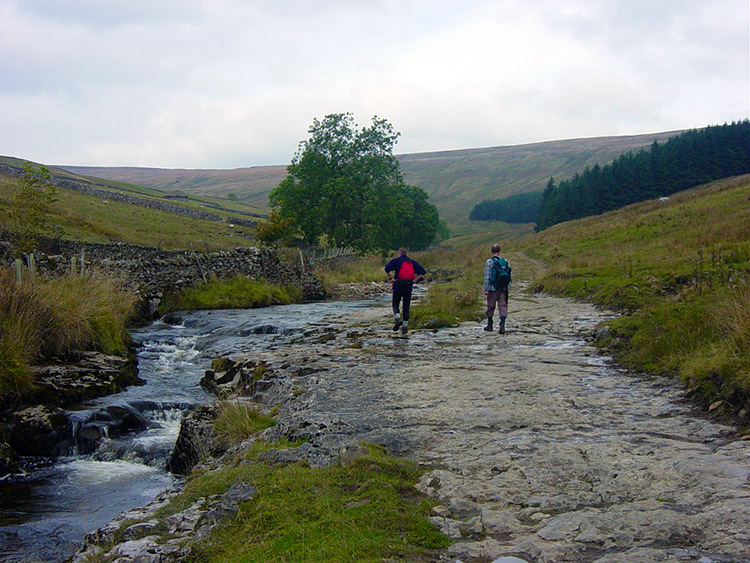 The options were straight up following a watercourse which had delightful little falls to enjoy or to walk south to meet the Pennine Way/ Three Peaks path. Been there, done that so it was a unanimous decision, straight up. This was after Dave adjusted his boots which were grazing him a little bit. For the first time he said, and I suggested it was because we had done a good deal of squelchy bog walking on Cosh Outside. After he had readjusted we followed Jez up the bank. The adjustment seemed to work for Dave. He walked up methodically but without problem. It was a tough climb though and at the top I thought "I am glad that is over". So I thought. At the top of the climb and before we did the last few feet onto the windy plateau of Plover Hill we stopped for lunch. Most of the climbing was done and it was a sheltered spot to eat. Great views of the countryside with Ingleborough and Whernside were ours to enjoy while we rested. It was lovely and I decided to send a text to Steve telling him we were on his favourite hill. He sent a text back saying he was on the south-west coastal path. Apt response from a walking buddy. Then it happened! Just when I was moving to put the phone back in my pocket I knocked my flask cup off a stone that protruded from the dry stone wall we were resting besides and off it went rolling down the bloody steep hill I had been relieved to have got up. Watching it tumble was surreal, like in slow motion and after what seemed like an eternity it came to rest on some scree. Blooming heck, I had to blooming go back down again to retrieve my drinking utensil. As Dave and Jez laughed their socks off I scrambled down to the scree area that had arrested the cups fall. It hadn't fallen all the way thanks to the scree but it had tumbled an excruciating 100 metres. I was not impressed at having to do the extra work. 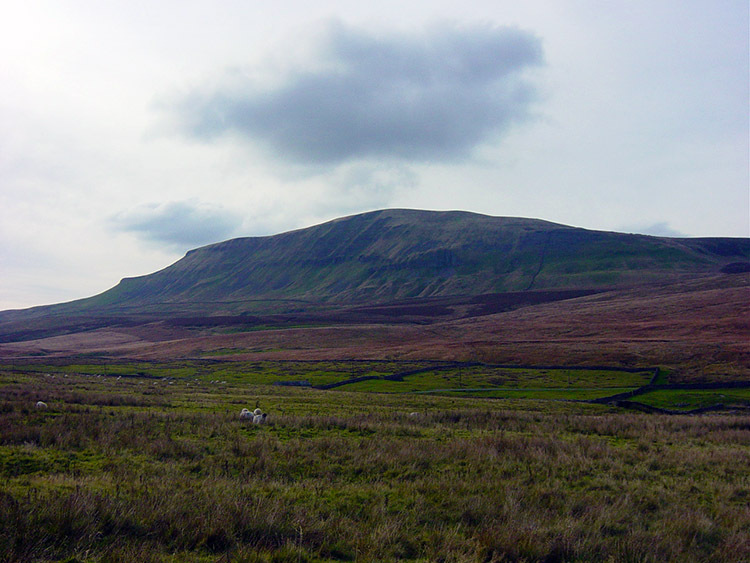 After our extended break we moved onto the Pen-y-ghent plateau at Plover Hill and walked, often in bog as the Plover Hill area of the hill is a bugger to walk. By this time I had given up the delicate stepping through water and simply ploughing straight through it. Still, what was inspiring was walking up the rump of Pen-y-ghent to the trig point and this fact kept me going through the quagmire. 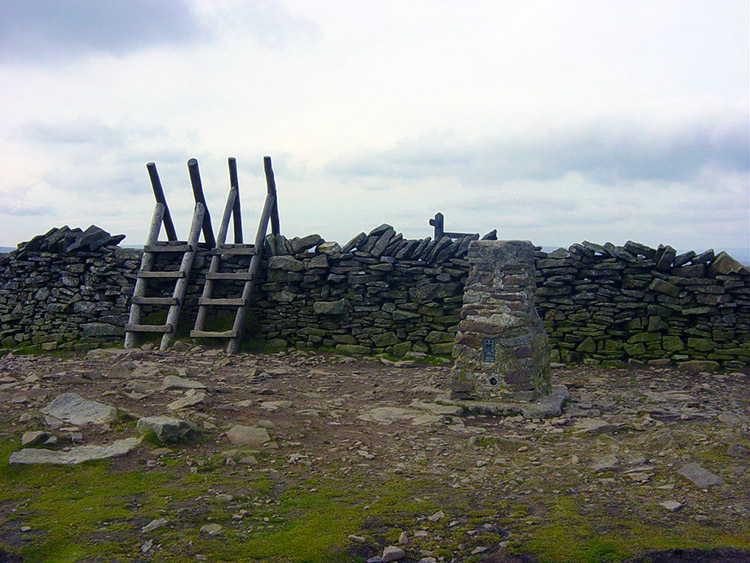 I always enjoy being at the top of Pen-y-ghent and once we arrived we took the mandatory trig point picture. After the photo shoot we moved off the hill quickly as the wind was howling on the top. We made our descent by scrambling off very steeply to Fawcett Moor. As we were doing so I kept looking back at the majestic rock pillars that cover this part of the hill. I named the outcrops 'The men of Pen-y-ghent'. I had never made this descent of the hill before and never seen the men of Pen-y-ghent so close. It was great to be so near to them and see the way they had stood their ground as the rest of the hillside had fallen away over a vast length of time. After traversing the hill because of its steepness we finally lost height and were on Fawcett Moor. We knew the way from the moor as the Dawson Close bridle road to Litton was in clear view as we had descended from Pen-y-ghent. And so as Dave and Jez walked south east to Blishmire Close I tracked due east to visit Pen-y-ghent Gill before cutting off to meet them on the beginning of the Dawson Close bridle road. The Gill is a pleasant little spot with a profusion of limestone pavement at the head of the Gill. I enjoyed the views of the Gill and surrounding countryside before setting off to meet the boys and then we enjoyed a final easy walk on the bridleway to Litton. 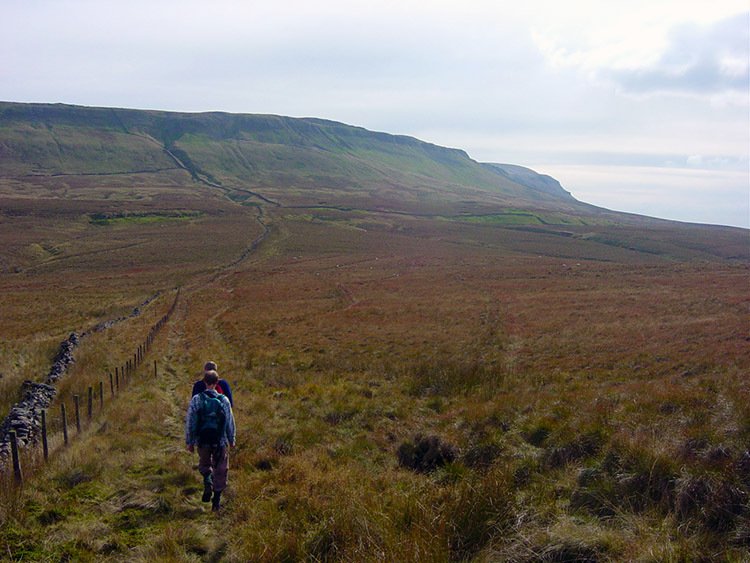 The walk had provided an interesting and enjoyable alternative aspect of climbing Pen-y-ghent. 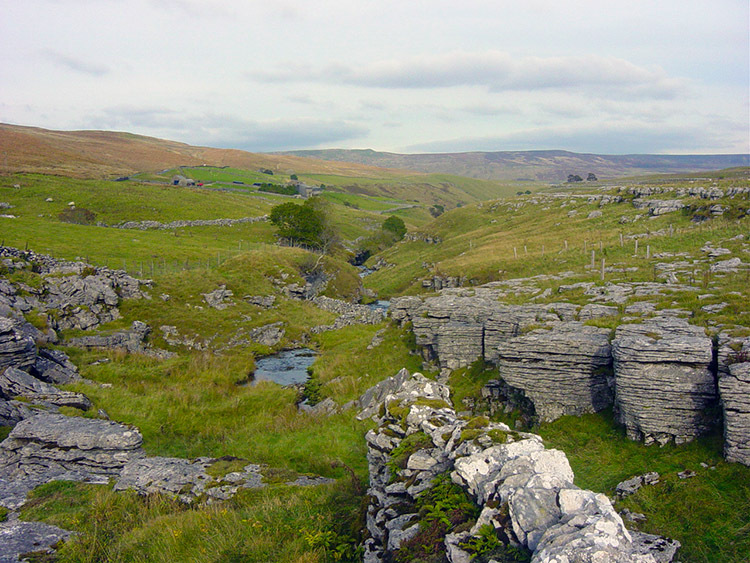 If you like something different and a quieter alternative to the normal Horton in Ribblesdale climb of this great hill then I recommend you try this walk out. You will not regret it.